77402 ENT RUSSIA (1980) Cyclists racing*. 4 kop entire with corner illustration. Moscow Olympics. 77403 EMA U.S.A. (1980) Schwinn bicycle*. Red meter cancel on postcard to Germany - Breakaway on a Schwinn in '80! 77400 OBL GERMANY (1980) Cyclists racing*. Illustrated cancel on card for Munster cycle race. 77401 ENT GERMANY (1983) Cyclists on the streets of Neumunster*. 60 pf postal card (O) with corner illustration. 77404 ENT RUSSIA (1985) Cyclists racing*. 5 kop entire with corner illustration of 38th World Championship race. 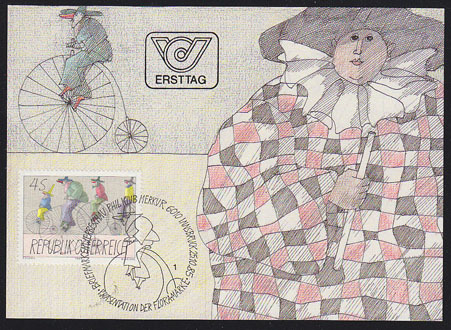 25007 EMA NETHERLANDS (1985) Stylized bicycle*. Red meter cancellation on cover: "Van Schothorst. Barneveld-Boxmeer." 76042 MAX AUSTRIA (1985) Carnival figures riding bicycles*. Maximum card with thematic cancel. Scott No 1328. 77399 ENT RUSSIA (1988) Cyclists in park*. 5 kop entire with corner illustration. Inscribed - Take the Whole Family cycling in the country for your health. 77408 ENT JAPAN (1991) Bicycle*. Trees. 41 yen lottery card (N) overprinted "MIHON" (Spécimen) with drawing on reverse. 77650 ENT RUSSIA (1986) Tightrope unicyclist juggler*. 4 kop entire (O) with corner illustration of Leningrad circus and illustrated cancel of performer. 55646 ENT POLAND (1983) Circus wagon*. Clown on unicycle*. Postal card with illustration celebrating Artystow Circus Jubilee. 77655 EMA FRANCE (1998) Clown juggling on unicycle*. Red meter cancel on envelope - DauphiCirque - Ecole de Cirque - Grenoble. 68701 EP U.S.A. (1970) Christmas toys. Train. Horse. Tricycle. Baby carriage. 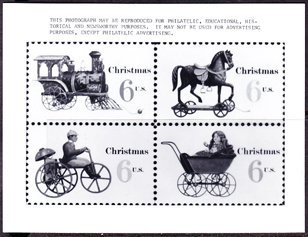 USPS publicity photo essay. Scott Nos 1415-8, Yvert Nos 907-10. 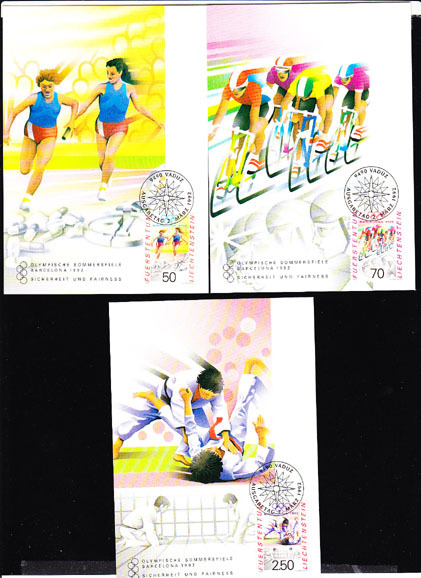 60885 MAX LIECHTENSTEIN (1992) Barcelona Olympics*. Set of 3 maximum cards. Scott Nos 976-8, Yvert Nos 976-8. 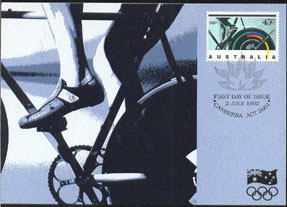 43320 MAX AUSTRALIA (1992) Cyclist - Barcelona Olympics*. Maximum card with thematic First Day cancel. Scott No 1268. 77423 MAX LIECHTENSTEIN (1996) Cyclist*. Maximum card with thematic cancel. Scott No 1081. 77420 CAR AUSTRIA (1909) Post bus. Ancient telephone. Caterpillar sledge. Stamps. Cycle messenger. Coins rolling into house. Interesting 20-page booklet that the mailman could distribute in small quantities to his customers at New Year. Contains ads, information, and bad jokes.